The ‘NEVER AGAIN’ Association’s co-founder Rafal Pankowski received this year’s Paul Ehrlich-Gunther K. Schwerin Human Rights Award. The Award was established in 1998 by the US-based Anti-Defamation League to honour those who have fought antisemitism throughout Europe. 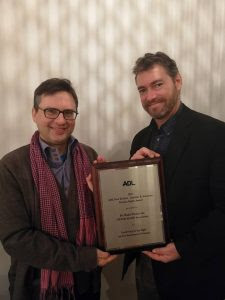 The award was presented by the ADL’s Director of European Affairs Andrew Srulevitch during his visit to Poland on 6 February 2019. In the preceding months, Rafal Pankowski had been subjected to numerous public attacks for his work in documenting and countering antisemitism and xenophobia. Several days before the handing of the award, government-controlled TV labelled the Warsaw-born researcher as ‘a horrible person’, ‘belonging to the worst sort of Poles’ who ‘lives from a hatred of his own fatherland’. In response, the Polish Human Rights Commissioner Adam Bodnar initiated a formal complaint to the National Council of Radio and Television in protest against the hateful language used on air. In 2018, Rafal Pankowski (who is also a Sociology Professor at Warsaw’s Collegium Civitas) authored the widely discussed article detailing the resurgence of antisemitic discourse in Polish media and politics, published by the Israel Journal of Foreign Affairs. Over the years he has cooperated with numerous think tanks and academic institutions including, among others, Chatham House (London), the Institute of Human Sciences (Vienna), and the Centre for European Studies at Chulalongkorn University (Bangkok). He was recently included in the annual ‘J100’ list announced by editors of The Algemeiner, a New York-based Jewish weekly. The list recognizes one hundred people who made positive contribution to the life of the Jewish communities in the last year and, besides political figures, it has included actress Sharon Stone, the UK’s Prince William and Indian conductor Zubin Mehta, among others. The ‘NEVER AGAIN’ co-founder was commended for his role in opposing antisemitism and racism.